Explore Galicia: 17 Unique Experiences In Costa Da Morte (Death Coast) - A World to Travel. It took a few visits before we finally decided to bring you this well-kept secret and list of unique experiences in Costa da Morte. Dozens for Jose and more than a handful for me, the reasons we weren’t sure about sharing it all over the place were many, but perhaps trying to keep its purity and pristine beauty was the main one. Thing is that after our latest visit, a couple of weekends back, we felt it was the right time to spill the beans for good – and make you jealous AF! – Yes! 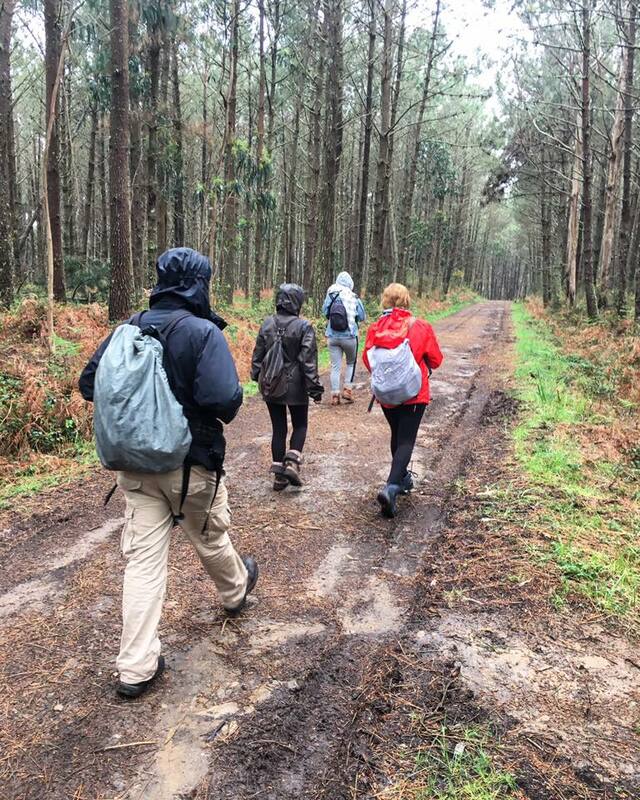 Because our base is literally on the stunning Galicia coast, barely an hour ago from this uncrowded paradise; yet another destination everyone should visit at least once in the lifetime. Between the coastal towns of Carnota and Malpica, and directly exposed to the Atlantic Ocean, the shore of Costa da Morte gets its name after the many shipwrecks along its betraying jagged shore. Unfortunately, earlier this century, it was also famous for the colossal oil spill from the Prestige that dyed black all that coast, spreading throughout the North of the Iberian peninsula all the way to France. But there’s much more to this region than the origin of its name. As sheer and inhospitable as it gets, Costa da Morte is also one of the most alluring places within the country and a Galicia must see place. Full of unique traditions, helpful inhabitants, and uncountable picture-perfect spots. Get ready to start craving seascapes, warmth even when the weather doesn’t help and exquisite seafood for a starter. Here’s our takeover, what we most enjoyed on our latest round there and what we’d thoroughly recommend to anyone looking for some quality time on the North West coast of Spain. Here’s our choice of the most unique experiences in Costa da Morte, the most stunning coast of Galicia. Welcome to the Death Coast! Benvidos á Costa da Morte! 1. Start your day on the right foot in front of Lires estuary. 2. Check in a fairytale cottage at Cabañas de Lires. 3. 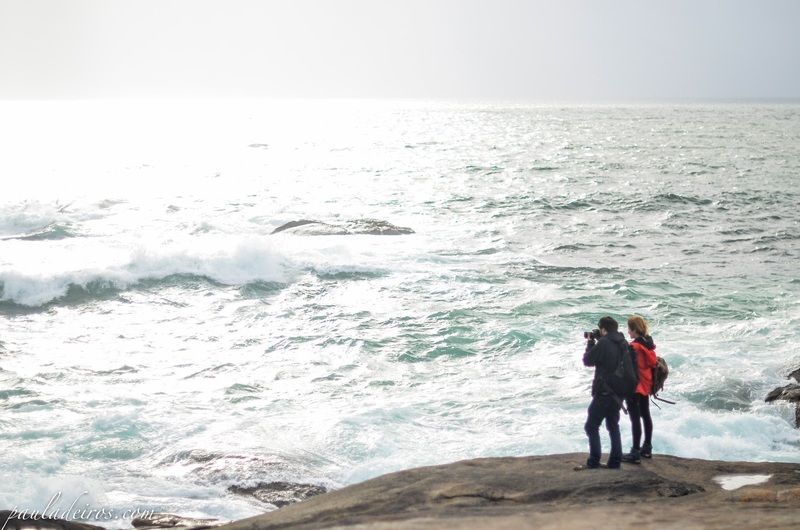 Get close and personal with the rough sea at Campo da Roxeira. 4. Enjoy some gourmet tapas at Cafeteria O Xardin, Cee. 5. Uncover one of the best-kept secret waterfalls in Galicia, Caldeiras do Castro. 6. Jump around the huge stones at Virxe da Barca’s sanctuary in Muxia. 7. Find gorgeous views after every turn, like these from Monte Facho. 8. Start a lighthouse series at Touriñán cape. 9. And a sunset one in Nemiña beach. 10. Immerse yourself in hipsterland and taste lots of different breads at Etel&Pan. 11. Admire the majestuous Praia do Rostro (Visage beach). 12. Visit a fishing museum at San Carlos castle, Fisterra. 13. Go to the end of the world and back at Finisterre cape. 14. Eat more seafood than you can dream of at Praia de Quenxe Restaurant. 15. Hike through the forests and seaside cliffs of Meigha Lirea hiking trail with DaFit. 16. Have a peek into Galician traditions while sipping some Queimada. 17. Learn how to surf in the unique Nemiña beach with Surf Costa da Morte. Meditate, go for a run, plan the rest of your day or just enjoy a coffee, something to eat and a memorable talk with a local at the local Lires beach bar. This estuary is the tiniest in Costa da Morte Galicia and a very special one for that matter. The Caribbean like waters might induce you to think the water temperature could be so warm but don’t be fooled and get a hold of a wetsuit if you are planning to be in the water for more than 15 mins. We have warned you! Ines and Braulio, the young couple managing this idyllic accommodation, have made every countryside prince and princess glamping dream come true and now it is possible to enjoy a slow-paced holiday in Costa da Morte in one of the three wood cabins they built in Lires. Cabañas de Lires have two stories, they host up to 4 people comfortably and are equipped with a full kitchen, bathroom, and a living-room. Surrounded by a gorgeous garden, customers can also enjoy the outdoor swimming pool on a sunny day, a barbecue area and a cozy Summerhouse on top of the Galician coast nearby beaches. Breakfast is served on a little basket picnic and includes freshly squeezed orange juice, a selection of teas and jams to choose from, coffee, milk, freshly baked french bread and homemade cake. Just what someone would need to gather all the needed energy to tackle some Costa da Morte goodness down!. While you are exploring Lires, make sure you go past the beach until Campo da Roxeira, a great spot to appreciate how rough this region can get. Even when I wasn’t surprised by the restaurant itself, that looked just like any other cafeteria would do, once the food arrived our lunch reached a completely different level. More than 10 kinds of appetizers populated the table before two gigantic omelets (cod and anchovies) arrived as the main dish. By the time the dessert was served, we were way too full already but still, enjoyed it. The owner Kiko and the Basque country cook working there clearly are doing a great job for Galician cuisine! Every once in a while, I still find myself amazed in front of a powerful Galician landscape. And many times, it happens to be a waterfall. Perhaps because we visited this one in Castro river (Couceiro, Muxia) in Spring, after a few days of rain, when it was carrying a lot of water. But I bet it is still pretty nice in Summer. In any case, a great stop not so far from the coast. Built in the 17th century, this church’s location couldn’t be more impressive. A sacred spot that has a lot to do with the nature of the place and the fishermen that risk their lives everyday in Costa da Morte, Virxe da Barca sanctuary was partly destroyed by a fire started by a lightning on the 25th of December 2013 but it was quickly refurbished and today is looking as good as always. Even when this is one of the spots that get more tourists in Costa da Morte, it is unlikely to find big crowds and as you can see in the pictures below, we barely enjoyed any company when we visited it. And realize, once again, how awe-inspiring Galicia is! This small peninsula – the most westerly point of the Spanish mainland – features a nice lighthouse, one of the 3 we recommend visiting in this post along with the one by Virxe da Barca sanctuary, in Muxia, and Finisterre lighthouse. But there are even more lighthouses should you were particularly interested in this topic, head to this other article for, IMHO, one of the most beautiful ones in Costa da Morte, Vilan cape lighthouse. A beach doesn’t just become a photographer’s favorite for no apparent reason. And Nemiña, in Costa da Morte Galicia, has been Jose’s beach of choice since he was a kid. Still amazed at how well-done and spot on everything was in this restaurant, from the food to the decoration, Etel and Pan is one of the places where you could feel home from minute 1 as it happened to us. Etelvino, photographer, and entrepreneur, and Palmira, artist, joined forces to bring their customers deli burgers, lots of different breads, gourmet can food (mainly seafood), salads and a selection of Galician wines to die for. We are aware of how distasteful and nerve-wracking is for some people the fact of sharing a table with an Instagram maniac or someone who really likes to have their food pictured but we dare you to visit this handmade kingdom without taking a single picture. Seriously. It was just impossible for us! Ask the locals. Unless they are into adrenaline stuff – surfers still enjoy its waters when waves are kicking in -, no one will tell you to go for a swim to Praia do Rostro. Hidden currents and some unfortunate events made it a sort of cursed beach. On the other side, the good news is that you don’t need to be an expert in water motion to appreciate and enjoy its beauty. So there you have it, yet another immaculate sandy spot with turquoise waters just for yourself because, did we mention Costa da Morte is mainly far from the usual touristy circuits? If there’s one industry that clearly stands out above the others in Costa da Morte, that is fishing. And there’s no better place to learn everything you always wanted to know about this art and the coast itself than the fishing museum at San Carlos castle in Fisterra. We really wish you get as lucky as we did and Manolo can go with you through it. No one knows better what everything is about than him and his stories will make you want to take him to lunch for more. From the many shipwrecks to how the inhabitants of this region survived humbly and with hard work, you need to make this one of your stops in Costa da Morte. 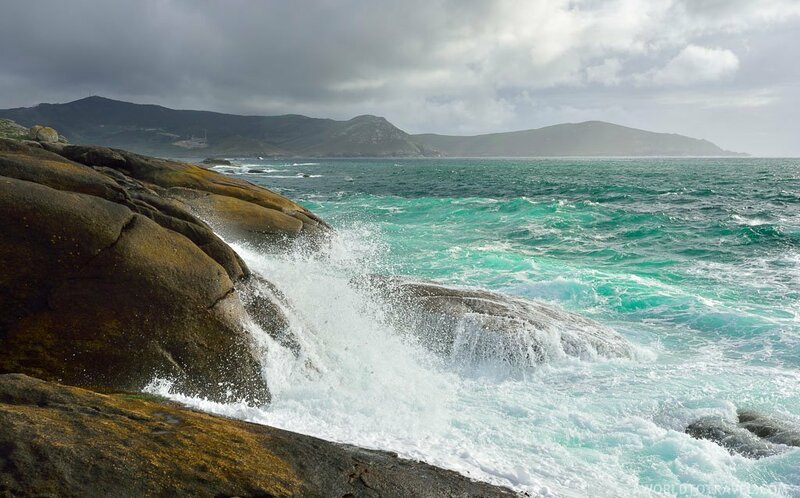 Once known as the end of the earth, and many centuries after the humankind knew better, Finisterre continues to attract visitors from all over the world. Some pilgrims continue Santiago’s Way from the real end of the same, the city of Santiago de Compostela, till this spot to give a proper closure to their enterprise. If you decide to give it a try, something that we couldn’t endorse more, please remember burning your used stuff (i.e. hiking boots) might be a recent – and stupid – sort of tradition but still is illegal, kind of dangerous, useless and again, a pretty dummy thing to do. As a result of this silly practice, some of the beautiful rocks of Finisterre cape have a layer of disgusting melted black plastic over them (as you can see in one of the pictures below). Hope this nonsense comes to an end soon! Enough said. Fresh and as local as it gets, the daily catches of this seaside restaurant in Costa da Morte Galicia will leave you speechless if seafood is high on your list. Recently re-opened for the Spring season, Meigha Lirea is a well-known 10.8km circular route with 326m of vertical ascent. Of moderate difficulty, it runs between Lires and Cee, and has the Galician coastal forests, Punta Mexadoira (the falls pictured below these lines), an overview of Praia do Rostro and some stunning cliffs among its highlights. Perhaps it is not one of the most difficult hiking paths to follow ever but if you would like to adventure more and check other not so known but still great routes in the area, we’d recommend you to contact the guys at DaFit, a young and dynamic team that leads them. And if you do so, say hi to Paula and Damián from us!. Here’s yet another picture of a rainy moment during those 10km. A happy gang (us!) in the forest. Queimada is a beverage made from Galician augardente, herbs or coffee beans, cinnamon, lemon peel, sugar and anything else the ritual master dares to add to the mix. What makes it so special and unique it is that while preparing the punch a spell is recited – to send the witches and bad spirits away – while the queimada is set alight and slowly burns. The colorful flames are an enchanting show and make it for an even more extraordinary tradition. I love queimada. When almost all the alcohol has burnt it gets sweet, easy to swallow and warm. And I truly appreciate the fact that even when this could easily stay just as the most touristy thing to do, it is still enjoyed by the locals on special occasions and why not, you should experience one during your Costa da Morte explorations too. Ruben is one of the patient and smiley faces behind Costa da Morte Surf, a surf school in Nemiña beach, with the right equipment and tiny playful waves to make anyone’s first baths a success. The best part is that you will be able to take away his knowledge and start polishing your surfing skills somewhere else afterward. To make your life easier, have a look at this map of Costa da Morte (please note the toponym is not costa de morte). It links the aforementioned numbered list with the actual spots. Disclaimer: Thanks to Veronica Pekecha, Alejandro Iglesias and all the other partners involved in making it happen! How did you find this article? We are looking forward to your suggestions, questions, and impressions on Costa da Morte Galicia! Please leave a comment right below these lines. In a few days I will have the good fortune to visit the Costa da Morte. I note that detallais experiences in your great product. Undoubtedly Galicia area of spectacular natural and wild beauty. Very interesting! Galicia has for sure some of the most beautiful views and natural landscapes from Spain. Although, the gastronomy in the area is also something that you definitely need to try. Very tasty i could say!